Please Note: Significant Plot Spoilers feature at times in this review. Within moments of beginning his latest escapade, the Doctor is faced with a dose of mystery. Why would River Song, who clearly cares so deeply for the previous regenerations she has met, now opt for bigamy - at least in some quarters - with some rather less sophisticated men? Does it connect in anyway with the Professor's latest quest involving a very rare and precious diamond? It would appear so, given the host of grubby and rather soul-less alien 'humanoids' that eventually come running after it. But even more alarming is her complete obliviousness concerning his actually being 'her' Doctor. What can he do to convince her? Furthermore one of River's husbands, known as King Hydroflax, is composed of man and machine. However the human head is not in good nick and it would appear that the artificial intelligence is taking more and more control. The consequences of this could be a little troublesome. The Twelfth Doctor may have survived an eternity in a strange pocket dimension, but just because these appears to be low stakes, it should not mean he can take his head's continued presence on his shoulders for granted. The Husbands Of River Song is decidedly counter-point in nature to David Tennant's swansong. Yes, we do get some continuity references such as the foldable wallet with all the past faces (including the War Doctor), but it does not take much effort on the viewers' part to get to the heart of the story. The main plot involving Hydroflax and the precious diamond is as easy-to-follow and carefree a tale as they come. And in terms of concentration, it requires not all that much from both children and adults watching in their living rooms. Even the Doctor openly admits to having had a dearth of laughs and pure enjoyment of late, as he welcomes the new developments unfolding around him and River. So in spite of tangible threat, and a good number of deaths (even if most of those do not apply to truly innocent individuals) this is a well-deserved 'break' for the most weary and emotionally tested Doctor to date. For those avid fans who watch episodes multiple times and can excel in Doctor Who as a pub quiz category, there may be an element of disappointment. At least at first there is more than a fair amount of events that take place before River does cotton on that the Doctor has achieved another life cycle, and is in her inimitable company. He is not some generic practitioner of (space) medicine. We get a fun scene or two where our title hero really revels in 'being in the know' at River's expense; especially when he over-emphasises how most new companions actually do not react in amazement as they first experience the 'bigger in the inside' TARDIS phenomenon. But perhaps on the other hand not having a proper catch-up on-screen with River of the many events the Doctor went through as he pondered his being a "good man" up to the events where Missy made her presence known, and then the difficult choices he faced in his ensuing adventures in Series Nine could feel like a missed opportunity. There are several possible defences to this argument. We could always have some incentive for River in a later TV appearance to demand more details. If that never ends up transpiring, writer Steven Moffat has provided an option in the final bittersweet events of this particular story whereby the decades-long final night on a decidedly different planet can allow for all sorts of conversation and romance for the two partners in crime (and time). All the same, there is a very winning dynamic between two very fine actors in Capaldi and Kingston. Now the Doctor is the 'older partner' and has that gravitas, there is a real sense of experience and perspective that even an accomplished galaxy-hopping wunderkind like River cannot seriously aspire to. The witticisms they share together in this outing do not feel forced or smug; something that has bothered me during a good portion of the Eleventh Doctor's era. No, these are two people with some edge to them but who ultimately bring a lot of good to the universe. They carry a lot of emotional weight, and whilst much of the episode is light-hearted knockabout pseudo-pantomime, the resonance of these two remarkable characters and their relationship is not compromised in any way. The bad guys in this one do their job well enough and ought to linger in viewers' heads; especially impressionable children watching this during their afternoon or tea-time allocation of TV diversion. The sinister creatures that can split their heads open and back again may be most attention-grabbing in their shameless 'gross-out' factor. Yet it still is Hydroflax that is the better all round creation. We have a blustery but truly vicious despot, but also a robot /cyborg suit which becomes rather more ruthless than its supposed master. According to some reports, Moffat was not intending to make Greg Davies' character that much of a threat, or to be taken seriously. Yet I find this one-off guest antagonist to be worth the time and energy expended by the production team in design and special effects terms. Davies, infamous for being a tough-as-nails teacher in The Inbetweeners, manages to show a little range in his acting, if perhaps not being quite as funny in that he clearly must use the family friendly language a show like this requires. The staff abroad the star liner are also somewhat notably immoral, in that obsequious goodwill in greeting clients does not mean that they are particularly loyal. As it proves, the insect/humanoid hybrids are quite happy to compromise River and offer the Doctor as a token to the evil 'king'. Although Rowan Polonski's Flemming is a decidedly self-serving weasel, it still feels like he had no choice but to appease the maniacal Hydroflax robot. Somewhat shockingly, the moral standards of this story dictate that he and his colleagues must perish. As I stated when surmising The Zygon Inversion, the Doctor's judgement of crimes and people committing them can be a source of controversy. But it also makes the title hero a far cry from a two-dimensional Mr Perfect, which is important for this show to appeal to as many people of all ages as possible. Apart from Davies, the other publicised guest actor is a certain Matt Lucas. This rather innocuous-looking fellow was involved in many sketches with David Walliams, who himself featured in Doctor Who back in 2011. Little Britain may not have been around for the best part of a decade, but it was notable for giving Tom Baker a whole new identity outside of his career-defining Fourth Doctor image. 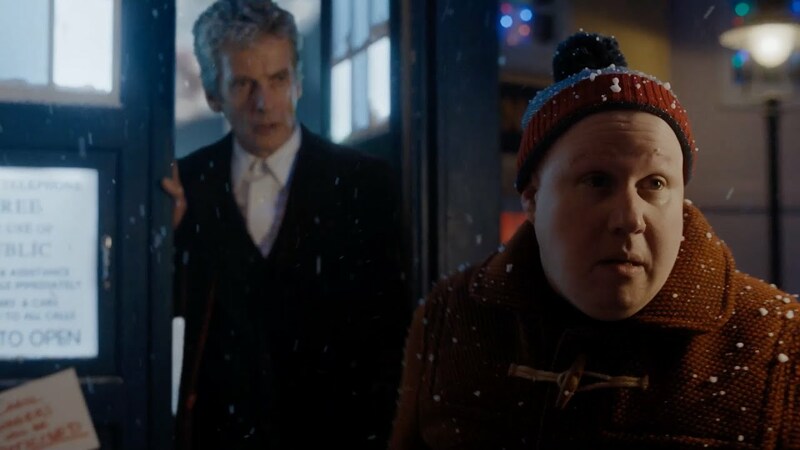 That all being said I find Nardole just another character lacking any real depth or backstory, even though he is suitably inoffensive for the type of adventure this is. I just wish that Lucas was given some really good comic material and made a figure of fun, rather than (swiftly) one of sympathy as to his unenviable fate. His squealing as he is bonded to the Hydroflax robot unit is not pleasant, and yet also feels really silly and careless. What could be a threat that is recounted in legend just not feel properly credible. Ramone, another husband of River, endures a capture in the ally that is a little better in terms of initial suspense. It does get spoilt by the actual presentation of Nardole pointing a huge gun at his head and indeed Ramone is fleetingly used after this sequence, which makes it end up feeling a bit pointless. And this then leads onto one of the definite weaknesses of the special, during the section where Doctor and River are ensuring that they have managed to emerge unscathed from all the danger around them, and the Doctor even shows his philanthropy like rarely before by pointing the way to riches for a construction worker. There is no sense of regret over letting Nardole and Ramone endure a much longer life span, and one whereby normal human contact is severed. It just seems to be put there as some kind of fence-sitting acknowledgement. Scratch the surface, and both the Doctor and River look selfish and dismissive in not helping. It is not quite as galling though as what the Tenth Doctor did in 'saving' Ursula in Love And Monsters, that much I can concede. When all is said and done, Husbands is a more than decent slice of televisual nourishment that should hold its own against other forms of recreation that pop up during this time of year. It does not offer any groundbreaking themes or ideas, or have a true standout guest character. However, there are some very good set designs, the plot encompasses enough different locales without misjudging pace, and the final scene is as powerful as any Who story this century. In closing I wish a truly splendid festive season to all readers that spend their valuable time perusing reviews in this corner of the Internet. Let us hope the travels of the Doctor will continue to enthral in 2016, and a considerable way beyond as well.